Indole-3-carbinol (I-3-C) is a natural substance that has been extracted from the cruciferous plants. It is metabolized in the body to its main metabolites that help avoid the development of the estrogen-dependent proliferative conditions. Diindolylmethane (DIM) is one of the main metabolites of indole-3-carbinol that is formed from two of its molecules, demonstrates a higher structural stability and is effective in normalizing the estrogens levels, has the antiproliferative and antitumor effects. Resveratrol is a powerful natural antioxidant with an oncoprotective effect that promotes healthy longevity, activates antioxidant protection and neutralizes the effects of free radicals, which can lead to the damage of organs and systems, mutations and cells transformations when entering into reactions in the body, potentiates the antiproliferative effect of indole-3-carbinol. NUTRITIONAL AND ENERGY VALUE (CALORIC VALUE) PER 100 g OF THE SUPPLEMENT: proteins – 15.0 g, carbohydrates – 1.1 g, fats – 0 g; 273.7 kJ (64.4 kcal). 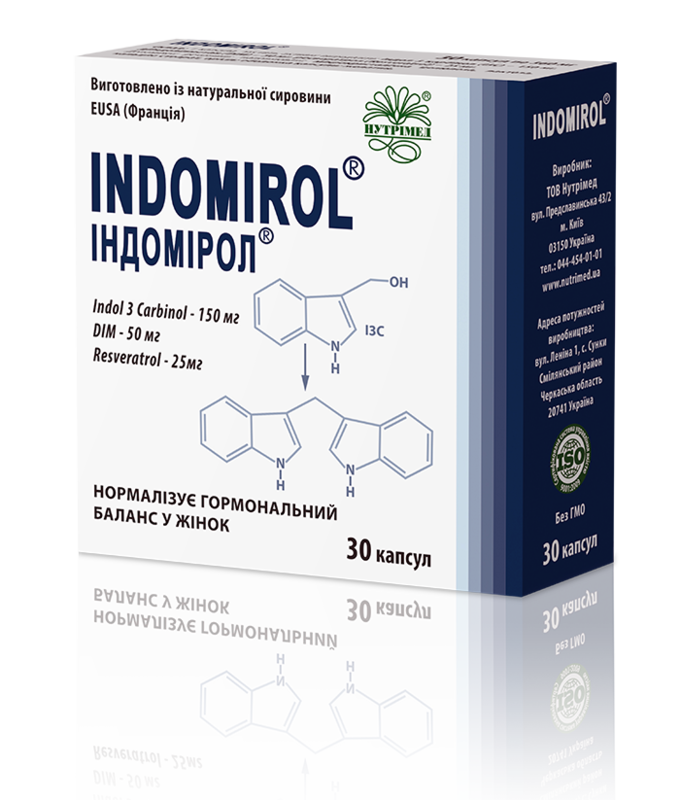 INDOMIROL® is a balanced complex of non-hormonal biologically active substances, the functional properties of which help maintain the normal balance of female reproductive hormones, reduces the risk of the development and progression of estrogen-dependent conditions. RECOMMENDATIONS FOR USE: INDOMIROL® is recommended for normalizing the functional status of the reproductive and genital system in women. A complex of non-hormonal biologically active substances contained in INDOMIROL® helps normalize estradiol metabolism, selectively binds to estrogen receptors, has antiproliferative and antioxidant properties. METHOD OF ADMINISTRATION AND RECOMMENDED DAILY DOSE: adults (women) should take 1 capsule 1-2 times daily after meals swallowed with plenty of drinking water. The treatment course is 3-6 months. The course can be repeated if needed. CONTRAINDICATIONS: pregnancy and lactation, individual intolerance of the ingredients.